It started out as just another day on this awesome "Grace Filled Journey," but it turned out to be a day to remember. One of the reasons that Kyle and I started this blog was to share our experiences with Grace. However, when we began, we thought that would be trips to the zoo, the movies, preschool and maybe a few other special things along the way. We were so honored to "Step Up to the Plate for Grace" today! But somewhere along the way, the communities in this area have truly made this such an amazing "Grace Filled Journey." And today was no exception. I was so excited to help Grace throw out her first pitch today. We arrived in Morrisonville just before the start of the baseball game between the Mohawks and the Lincolnwood Lancers. And Grace got to throw out the first pitch. It would be her fourth and final first pitch of the high school baseball and softball season. Her very first pitch was the game between these same two teams in Raymond. It's just awesome to see how much love and support these kids and their families have for our Grace. When we arrived at the park, both teams were wearing specially made shirts that said, "Step Up and Take the Plate for Grace." Morrisonville was wearing shirts with red sleeves and Lincolnwood was wearing shirts with orange sleeves. Since this game was at Morrisonville, their team had graciously provided shirts for us to wear to the game, even if Kyle did take a bit of a ribbing for not wearing orange. He was a pretty good sport about it, although I still think he's going to try and find an orange shirt. Kyle has asked me for the last two games if I wanted to help Grace throw out a first pitch, and I said no the last time. But I figured this was my last chance to help her with one of them. So, I said I would give it a try. Check out Grace's cool new commemorative base. We are planning to hang it up in her room. They called us out to the field, and the first thing I noticed that they had written "Step Up to the Plate for Grace" on the actual home plate. How cool is that! We were really impressed, and fortunately for me, Kyle didn't take Grace's stroller all the way to the pitcher's mound. I didn't have to help Grace toss the ball very fall, which was good, because it still bounced in the dirt before it got to the catcher. But I'm so glad I had the chance to help her with one of her pitches. After she threw out the pitch, the Morrisonville coach talked to the crowd a little bit about our story and presented Grace with another shirt matching ours, except more sparkly. She also got a Morrisonville baseball and a commemorative base donated by Schutt Sports and decorated by Lela Ferrill. We can't wait to hang it up in her room. Grace's biggest fans, MHS teachers Janet Walch and Patty Christian brought her all sorts of goodies. Then we settled in to watch the game with Grace's fan club, including Grandma and Grandpa Galer, Grandpa Herschelman and her cousins, Kayley and Kensey Armour, who doted on her the entire time we were there. We also enjoyed many goodies from the concession stands, and the team was donating 50 percent of the proceeds to the INAD study. Kyle (with some help from Kayley and Kensey) take their shot at the fundraiser. After the third inning, they had another fundraiser planned. For $1, anyone could buy a small baseball and then toss it onto the field, trying to be the closest to the base near the pitcher's mound. We got three, and Kyle, Kayley and Kensey had fun throwing them out. It turns out that Grace's Grandpa John has a really good throw, and he won and donated the money back to the study. And he was really excited to win. Grandpa John takes his pitch at the fundraiser, and he won! Both teams also had another fundraiser, they had pledge sheets where you could pledge a player for how many singles, doubles, triples and home runs he would hit during the game. The teams are planning to present checks from both special games at the upcoming regional tournament in Lincolnwood within the next few weeks, and it will be very well used in the research study. We are SO honored all these players and coaches have joined our journey. But whether the donation is $1 or $1,000, we feel so honored that these teams have asked us to be part of such special games this year. To be able to make such amazing memories with Grace is something we will always remember. We will always hope that one day Grace will be able to run across home plate on her own! Yup, just another awesome day in this "Grace Filled Journey." It seems like Grace is getting to be an old pro at pitching in high school games! The senior Lady Redskins gave Grace a teddy bear and a signed ball. We have been so honored that Grace has been invited to throw out the first pitch at several high school baseball and softball games this season. Each one has been a unique experience, and we've made memories that we will always treasure. Earlier this season, one of the Nokomis Lady Redskins' coaches, Bruce Cox, asked Kyle if Grace could throw out a first pitch at a softball game this season. Kyle looked at the schedule and picked the Morrisonville game, since the Mohawk family has sort of adopted us as well. Hanging out with Grandma and Grandpa Galer before the game. Monday was just a gorgeous day for a softball game, and the Lady Redskins and the Lady Mohawks treated us like we were royalty. The princess is all ready to throw out her first pitch! Before the game started, the senior members of the Lady Redskins presented Grace with a signed yellow softball (I think she's going to need a display case for her growing collection of sports memorabilia!) and a Redskin teddy bear with a red outfit on. Grace just loved snuggling with the bear. Grace snuggled with her daddy and her new Redskin teddy bear! Then, all three of us had the chance to line up with the team along the first base line for the singing of the National Anthem, which was something we hadn't done yet, and really cool! Lining up with the team for the National Anthem. Then Bruce Cox got the microphone and began to share our story. He said the team had "something brewing" and would be collecting donations in a coffee pot throughout the game. They also passed out purple "Gracelets" to anyone in the stands who wanted one. The team ended up raising $260, which will definitely be put to good use for the INAD study. After that, it was time for the big first pitch! With a little (or a lot) of help from her dad, Grace and Kyle took the pitcher's mound and made the toss. Kyle pitched the ball up in the air several times first, much to Grace's delight. They made the toss, and everyone cheered. As we made our way back to the dugout, I noticed one of the players had her "Gracelet" tied to her ball glove. The players couldn't play with them on, but she wanted to make sure she had it with her during the game. We are so honored by those sharing in our "Grace filled journey." As Kyle took his spot along the fence to cover the game, Grace and I made our way to the bleachers to watch the game and cheer for both teams. Grace's busy social schedule certainly keeps us on our toes, but we feel so honored that the communities in this area have adopted our family and given Grace so many experiences this year. We'll never, ever forget the kindness shown to our family. We love you all! This is a guest blog written by our friend, Kendal Elvidge. I have a lot of fond memories from the Lincolnwood High School gym; games, dances, graduation and banquets all still resonate with me to this day. But it’s the memory of a recent conversation that sticks in my mind these days. Shortly after a Lancer basketball game this past fall, I was walking around the court making idle conversation with fans when I met my good friend Kyle Herschelman at center court. Our conversation started as all conversations do, I made a joke about screening who we let into the building or a cracked about Kyle’s always fashionable bow tie. Kyle not to be out done fired back with his own quick wit, probably something to the effect of; I can’t believe they actually hired you or you still work here. It was the typically quick wit thrown between friends that only friends can value. After the warm introduction we turned our focus to the results of the game and our quick analysis. As the conversation came to end we gave other parting shots and I started to walk away. Just then Kyle said “before you go…." and all the sudden our conversation became very real. Kyle began to inform me of Grace’s condition, the diagnosis they had received, and the long term prognosis. For only the second time in recent memory I found myself speechless, at a loss for words. I mean really, what do you say to a friend that just told you his daughter has been diagnosed with one of the rarest neurological disorders in the world? Stunned to my core I said the only thing I could think of, “We are here for you; whatever you need.” At that point I didn’t know what that meant, but thanks to the perspective of a four-year-old, today I have a better idea of what that statement means. The Elvidges get ready to take off in the marathon relay event in Champaign on April 25. A few weeks after our gym conversation, the Herschelman family joined us and some other family friends at our house for New Year’s Eve. I was a little nervous as I didn’t know how to explain to my daughter Peyton, who was four at the time, about Grace’s condition. I didn’t know how to explain that she couldn’t talk, walk, or play like her other friends. As most parents probably are, I was nervous about Peyton asking a question like typical kids do, bluntly. However like a lot of things in life I was over thinking things. The night went as smooth as a night of toddlers, pre-k’ers, and exhausted parents clinging to their youth waiting for the ball to drop could have expected. The kids played, adults talked and good times were had. Peyton brought Grace stuffed animals and books and showed her just about every toy she had. As the night ended, we loaded sleepy, melting down kids (and parents) into cars and said our goodbyes I breathed a sigh of relief that things went as well as they did. The back of the shirts say, "Today I run for Grace." Then a moment of true perspective was washed over me. My wife, Katie told me that while putting Peyton down for bed Peyton said to her, “I know Grace had fun. She smiled at me a lot.” It was the perspective of a four-year-old that brought me vision of what those words I said to Kyle truly meant. Being there for whatever they need simply means being the friends we always have been. It means treating Grace like the vibrant, beautiful little girl she is and not a diagnosis. Grace is a child who gets cranky and tired, she smiles when she is happy and cries when she is sad. Supporting Kyle and Mary simply means being friends who bring joy to their family, trying to create as many positives as we can during this difficult time. Fast forward several months, and that is exactly what the people of Montgomery County have done for Grace and her family. Hordes of strangers, mere acquaintances, some close friends and family have brought joy to this family in what has to be the most trying time of their life. It seems like everywhere you look coaches and student athletes, schools, clubs and organizations are hosting events, bringing gifts, raising money and embracing a Grace filled journey. Grace has thrown out pitches at softball and baseball games, been crowned a queen, and been, through bright eyes and a beautiful smile, the inspiration of many. She has made more public appearances in the last five months than her father Kyle has made in a lifetime. People have rallied around this incredible family and have turned Grace into a social butterfly. With all that has been done for them, and will continue to be done for them, it’s hard to find a way to make our own unique impact. But then my brother and sister-in-law came up with an idea and we ran with it, literally. 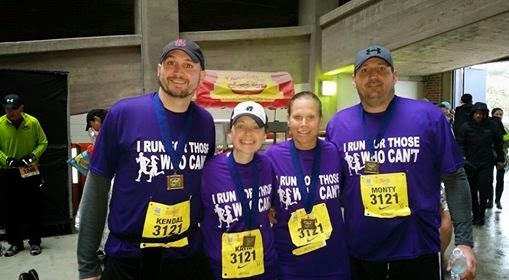 Back in July, they came up with the wild idea of running the marathon relay run in Champaign. My wife and I agreed to the idea, probably not thinking we would actually do it, but really liked the idea of thinking we could. Then Grace’s story came out and we found the inspiration to make the relay a reality. We decided to dedicate our run to a special little girl. After months of training and preparing for the big day my wife, brother, sister-in-law, and I, dressed in purple shirts that read “Today I run for Grace” on the back, took Champaign-Urbana by storm. Unfortunately, for us an actual storm decided to hit Champaign-Urbana as well. While we embraced the cold and rain, the race was cut short and we only completed three-fourths of our run. However, we knew at the end of the day we did something that would bring joy to the Herschelman family. 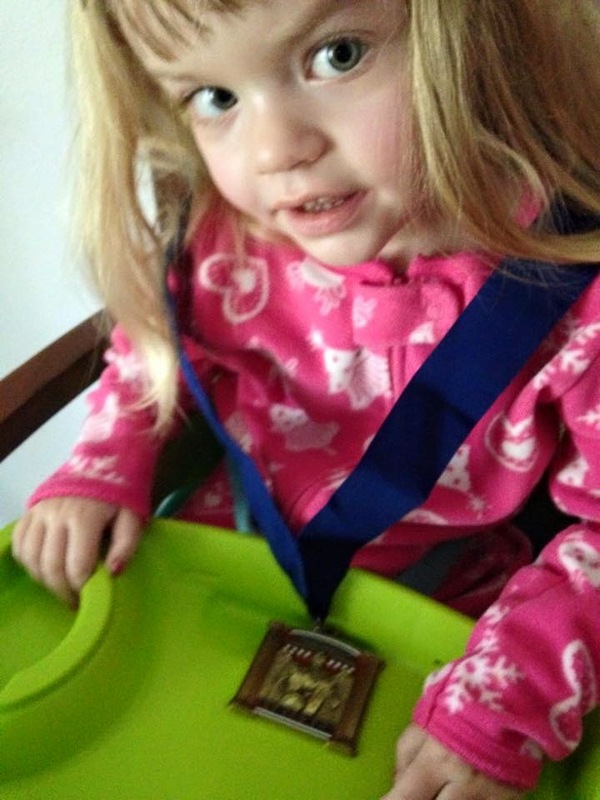 This is Grace with her medal from the Elvidges. 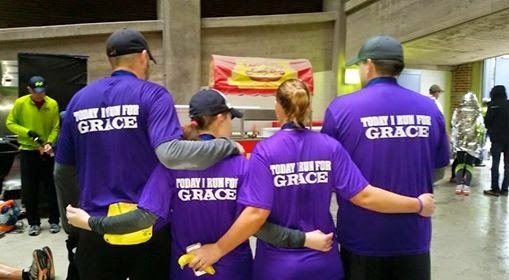 Our purple shirts garnered attention from other runners who wanted to know Grace’s story. We brought home medals, not just for ourselves, but one for her as well and we also brought home a hope that this little girl will inspire others the way she has us. I currently have two 5Ks this summer, possibly the Big Dawg challenge with Kyle, the 5k for Grace in September, a half-marathon in October, and the half-marathon next spring back in Champaign that I am looking to run. I started running mostly for the exercise and stress relief. The more I ran, the more I began to enjoy the individualized, you and the road, mentality of running. But now, I have a purple shirt and the inspiration of Grace as added motivation. It’s a simple gesture, but if I can spread the word of Grace and bring smiles to the Herschelman family, I know it’s a gesture that is appreciated. Much like a four-year-old and her stuffed animals, I know Grace appreciates it because she smiles a lot. So, it doesn’t matter if you’re young or old, if you walk or run get out there for a vibrant and beautiful little girl, who is an inspiration and truly puts life into clear perspective. I would like to thank Kyle and Mary for letting me contribute to their blog. As parents, citizens of Montgomery County, and dear friends they are a true inspiration. I would also like to thank Mizzy Tischkau for, not only the shirts, but for donating the cost of the shirts to INAD research, such an amazing gesture of generosity. If you've lived in this area for a very long time, you probably met my grandma. If fact, I'm sure of it. And somewhere along the way, she probably brought you a pie. This weekend, my family had to say goodbye to a remarkable woman, and though our family will mourn her loss, so will our community. Because in so many ways, my grandma was this community. 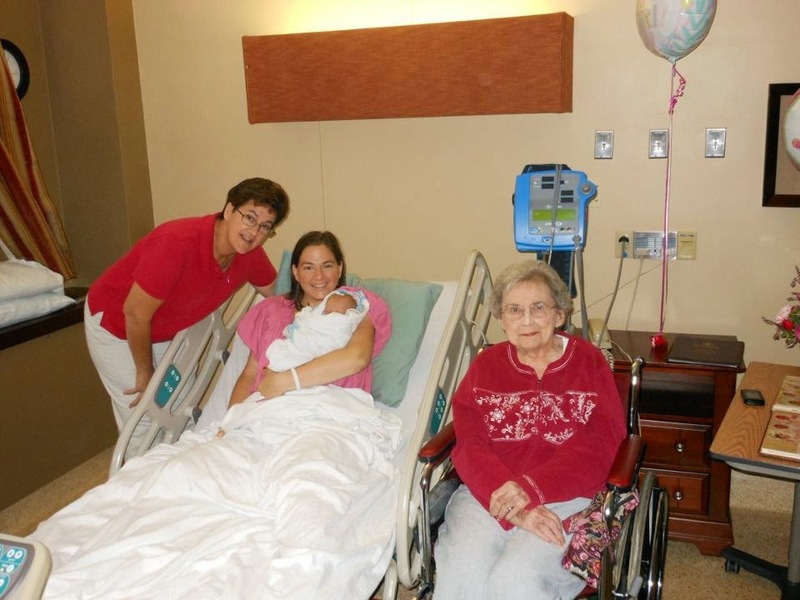 This is the day my Grandma Nancy got to meet her first great-grandchild. Although my grandma was not born and raised in Montgomery County, it was truly her home, and she welcomed everyone here with open arms. She moved to Hillsboro in the 1950s when she married my grandpa, and I think she always remembered what it was like to be a newcomer to small town. One of my favorite stories comes from Jeff Eisentraut, owner of the Orpheum Theatre for the last ten years. Shortly after they moved to town from Iowa, my grandma showed up at their door with a fresh baked pie. Even though she had never met them before, she wanted them to know how glad she was they were here. And that's just one story. 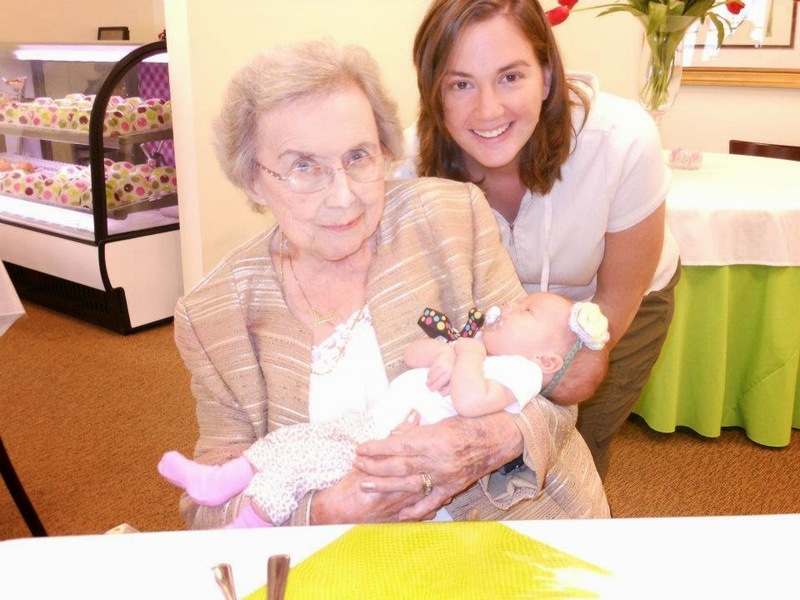 As we stood in line at visitation on Friday night, we heard so many wonderful stories of my grandma's kindness and generosity. And just what a difference she made in her community, one person at a time. 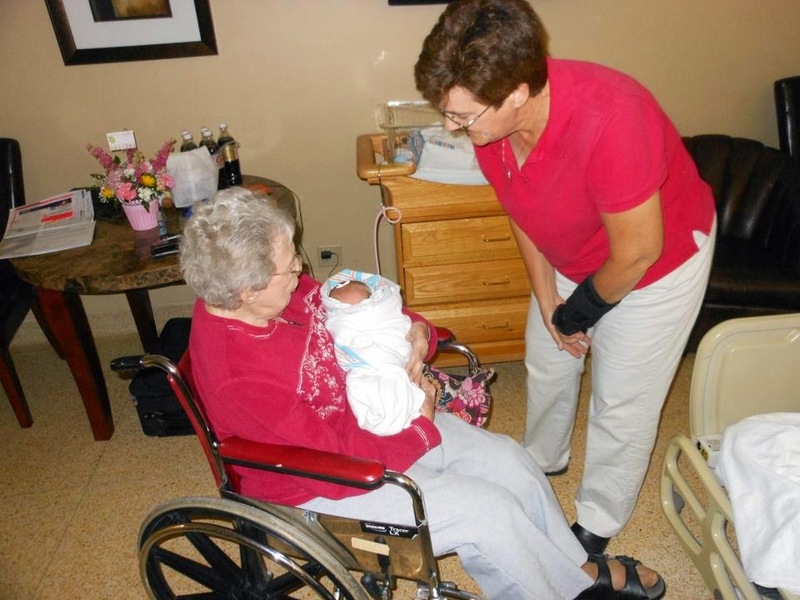 The first time Grandma Nancy got to hold Grace. One of the biggest lessons I learned from my grandma was in her smile and her positive attitude. Everything she did, she did with a smile on her face. Even when she was in the hospital or when times got hard, she would always tell you she was just fine, and then want to know everything that was going on in your life. My grandma also taught me a lot about hard work, as she was one of the hardest workers I knew. In her younger years, she could be seen working for Illinois Power or taking photos on newspaper assignments. She loved both of those jobs so much. Having lunch at the tea room in Mt. Olive. Thursday lunches were always our favorite! But she also knew how to balance her work with her love of family. I remember lots of weekend trips to St. Louis with my family and grandparents. We went to Union Station and the Zoo and rode the Metro Link. I can remember riding in the back of grandma and grandpa's station wagon, and even going on assignments with them sometimes. I'm sure that's one of the places I got my love of journalism. I got a lot of really great things from my grandma, things that will live on in me even though she's gone. Kyle even suggested we take on welcoming new residents with some homemade cookies (we aren't as good at pie). I'm sure we will find other ways to carry on her spirit as well through our efforts at the newspaper. We always loved seeing Grandma Nancy at family functions. Although goodbyes are always hard, we will always have memories to cherish of a remarkable woman. A woman who always tried to think of others instead of herself. A woman who always wore a smile and a woman who always loved her family. In celebration of a life well lived, I hope you will find a way to help her spirit live on in the kindness and generosity you show in your community each and every day. Remember that a kind word or even a smile can brighten up the darkest of days. 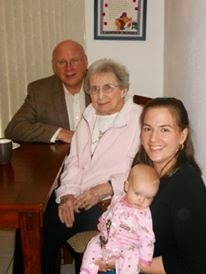 A four-generation picture on the day Grace was baptized. We love you, grandma. May your spirit live on in each of us, as we make your community the best place to call home. We’ve been blessed to receive so much support from so many groups of people, ranging from friends to family to community groups. One of the coolest things I’ve experienced is the support of one of those groups - my fellow sportswriters. Bill Walker, the sports editor at the Greenville Advocate, was one of the first people I told about Grace’s diagnosis. He’s been a good friend and I used our work on the South By South Central podcasts as a stress release. Hopefully we can get those back up and rolling this fall, if not sooner. Andrew Harner was the former sports editor at the Vandalia Leader-Union before he abandoned Bill and I for the greener pastures of his home state of Ohio. The three of us often helped each other out by sending photos or stats or other information when the other couldn’t be there. His daughter Miranda has had some health issues of her own and his family is often in my prayers. I really appreciate that he was one of the first to reach out when my column on Grace’s diagnosis was published. There have been others too. Derek Parris of the Breeze Courier in Taylorville did an excellent article on the work Morrisonville High School has done to raise funds and awareness for INAD and our little girl. If you live in Taylorville, you probably saw it on the front page of the paper a while back. Both Ryan Mahan and Dave Kane of the State Journal-Register have both lent their support to the cause as well. Dave was quick to ask for one of the purple Gracelets and mentioned Grace in one of his “Point After” segments when she was named an honorary Lady Hiltopper. More recently, he has helped spread the word via social media, tweeting out some of my posts on Grace and promoting the “Grace Cup” an all-star soccer game we will be hosting in June. All of these people have helped inspire me to keep moving forward - with my job, with my life, with my quest to raise awareness for INAD and to find a treatment and cure for this dreaded disease. I think all of them are good at their jobs, but even if they weren’t, they’ve proven that they are good people. And that is way, way more important. Tonight I went on a date with someone other than my wife for the first time in eight years. My beautiful date for the evening. A week or so ago, Mary told me about a fundraiser for the Litchfield Middle School volleyball team that piqued my interest. 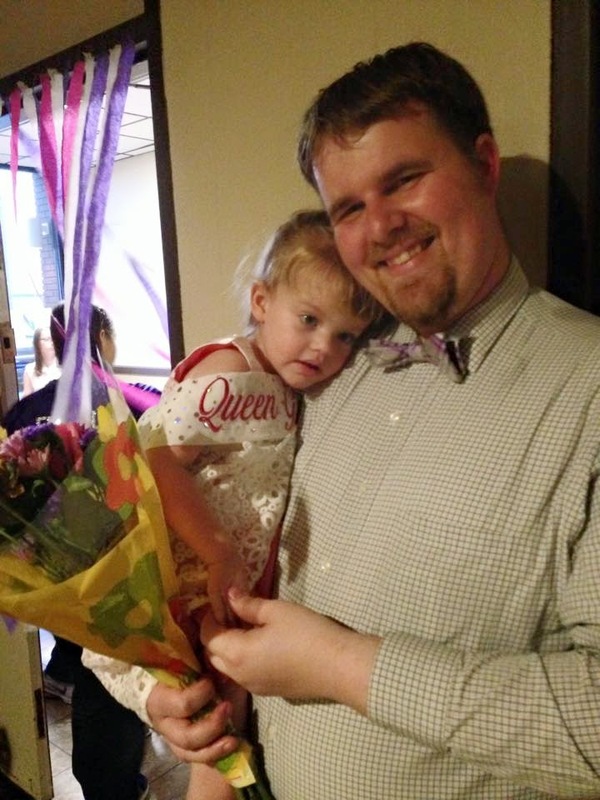 The team, which is funded by donations due to budget cutbacks a few years ago, was going to host a Daddy/Daughter Dance, combining two of my favorite things – sports and Grace. We weren’t entirely sure if we would be able to go or not, since we were scheduled to be in Carbondale earlier that day for the Southern Illinois Editorial Association awards, but we told Trish Fenton, one of the organizers, that we were going to try. Sharing a dance with my favorite girl. Yesterday, Trish checked with Mary to see if we were going to be able to make it because the volleyball team had something special for Grace. I think Mary and I both assumed that it would be a volleyball or a T-shirt or a stuffed animal of some sort. It wasn’t. We got there a little before seven and the Litchfield Moose Lodge was packed with little girls and their daddies. It kind of reminded me of a junior high dance, with the girls on the dance floor and a ring of guys just watching from the periphery. Time for a "selfie!" Thanks to Mary for taking it . . . . It also reminded me that crowds kind of freak me out sometimes so we slunk to the back part of the hall, where it was a little less packed. After making a donation and grabbing a quick photo at the “selfie stand”, we were retrieved from the back by Trish’s husband John. They wanted us up front. The official coronation by Trish Fenton and some of the volleyball team. After the current song ended, Trish asked Grace and I to come up on stage, where she bestowed the honor of queen on Grace. That wasn’t all though. Three of the team members gave my little girl a bouquet of flowers, a sash that said “Queen Grace” and a tiara fit for royalty. It had already been a little dusty, just watching all of the daughters dancing with their dads, little shoes carefully atop big ones, but Grace’s “coronation” about sent me over the edge. Grace got a little love from her fan club. The rest of the night was just flooded with emotion. Love – for not just Grace, but for Mary, who accompanied us on the date, because somehow the DJ just happened to play two songs from our wedding slideshow. Joy – for everyone that made this night possible. And hate. I hated the fact that Grace might never get the opportunity to go to her high school prom. I hated the fact that I might not get to have a daddy/daughter dance at her wedding. I hated the fact that this little girl who has brought so much love and joy to our community has been dealt this awful hand of fate. I’m never going to give up hope that someday Grace might be cured of INAD, but it’s not always easy to shake off the thoughts that come with the possibility that cure may never come. The worst was when I took Grace onto the dance floor while LeAnn Womack’s “I Hope You Dance” was playing. It’s the song my mom and I danced to at my wedding, partly because it’s a great song, mainly because it wasn’t very lengthy. Regardless, it holds special meaning, even more so now. Family photo op with the new queen. Tonight was a night I won’t forget, however the next few years play out. I can’t tell you how much the kindness of Trish Fenton, Jessica Krager and all of those involved with tonight’s event meant to Mary and I. A date with the best little girl in the world. As special as everything was at the dance, the best part may have been when we got home, just before Mary started reading to Grace and putting her to bed. I got what every guy wants after a date – a goodnight kiss from the most beautiful girl in the world. They may be rivals on the field, but on Tuesday night, the Lady Lancers and the Lady Hiltoppers shared much more than just their team colors of orange and black. Players on both teams showed they also had a special place in their hearts for our Grace. Grace brought her pink glove from Uncle Shane, so she was all ready for the game! As spring sports got underway in March, the Lincolnwood High School girls softball coach, Greg Neisler, asked Kyle if Grace could throw out the first pitch at a game this spring. Although Grace has four games lined up this spring, Greg was the first one to suggest it to Kyle. And we were thrilled. After looking at the schedule, Kyle asked if she could do it when the Lady Lancers hosted the Lady Hiltoppers on Tuesday, April 14. Grace was so excited to get a softball signed by all the Lady Lancers from Hannah Russell. We left work a little early on Tuesday afternoon to head to Raymond, not really knowing what to expect other than that Kyle would help Grace make her toss across home plate. What both teams had planned next for us was such a fun surprise. The Lady Hiltoppers had a handmade purple bow for Grace, just like the ones the players wore in their hair during the game. Just before the game got started, Coach Neisler invited the three of us onto the field, explaining that in the 13-year history of Kiwanis Field, Grace would be the first one to ever throw out a ceremonial first pitch, something the team did not take lightly. We had no idea she would be the first one ever for such an honor. With a little help from her daddy, Grace threw out the first pitch to catchers from both teams! Coach Neisler went on to share our story with the fans of both teams, and then three Lincolnwood players presented Grace with a signed softball from their team, as well as a one-of-a-kind jersey, which included logos from both teams and her name on the back. Then he invited three Hillsboro players to the field, who presented Grace with a handmade purple ribbon, that everyone on the team sported during the game. They even made two for Grace because they know sometimes she wears pigtails. Then it was time for the first pitch. Catchers from both teams took to home plate, waiting as Grace, with a little help from her daddy, made that toss. Tears sprang to my eyes as the pitch headed toward home plate, where I was standing, of course, taking lots of pictures. Beautiful orange and black balloons floated to the sky before the game started. We know there's a chance this may be Grace's only opportunity to play on some of our favorite teams, and the way these kids have embraced our Grace just left me speechless. And that's no easy feat, just ask Kyle. But the teams had one more surprise up their sleeves. All the players from both teams came back out to the field with orange and black balloons for a special balloon release in Grace's honor. They also presented her with three princess balloons, which she absolutely loves. As part of the festivities, the Lincolnwood concession stand had orange and black sugar cookies with Grace's name on them, which were sold for a freewill donation to the INAD study. Coach Neisler called Kyle later to tell him they raised $250 that night, and we are so very grateful. We will gladly send the money to Washington University as part of the INAD study, but more than the money, we're glad for the memories and the opportunities. I tell Kyle we have been given a challenge to give Grace as many life experiences as possible in her lifetime. Having the chance to throw out another first pitch and be part of two really special teams is something we'll never forget. Our favorite softball player with Aunt Mikaela! Orange and black unite, and we'll forever be proud to wear those colors. Don’t let the 9-0 score fool you, Friday’s game was a pitchers’ duel. Morrisonville scored eight runs in the sixth inning, but only two of them were earned and Lincolnwood’s Trevor Wagner and David Pope were nearly every bit as good as Austin Deal and Brady Wilkinson, who combined to no-hit the Lancers. But the best pitch of the day, for me at least, came about five minutes before Trevor first toed the rubber in the top of the first. Friday was the first of four first pitches that Grace is scheduled to throw out this year and it will be something I’ll never forget. Grace had quite the cheering section for Friday's game, including some of our favorite Armour cousins, Kayley, Kensey and Katelyn. Not that it was perfect. Far from it. Grace had just woke up about a half hour before we headed to the ballpark in Raymond and experienced what we like to call a “post-nap grouch.” At its best, it looks like a little wimpering and a few tears until we get ourselves woke up. At its worst, it’s a badger caught in a bear trap. Friday was in between the two – lots of yowling, a few tears, but nothing too major. Aunt Mikaela, here plying Grace with a beach ball during the post-nap grouch phase, made the trip from Arnold to see Grace's first pitch. She has been one of our biggest advocates through all of this, which means the world to me. Just before the pitch itself, Lincolnwood Baseball Coach and Athletic Director Josh Stone read a little something about INAD and how the Lancers were raising money to help fund the study at Washington University to help stop this ridiculously awful disease. I’ve known Josh for about eight years now, since he was an assistant coach and my brother Shane was playing for Lincolnwood. We have an awesome working relationship and his support of our family since Grace’s diagnosis has been incredible. I had kind of thought about how I was going to help Grace throw out the ball, but I could never really figure out a way to do it. So as Josh handed me the ball, I decided to just wing it. With Grace still wailing away, we headed to about halfway between the mound and the plate. I would have been lucky to get the ball to the catcher from the pitcher’s rubber unhindered, but with a wormy 30-pound sack of potatoes in one arm, I figured I’d take the safe route. When Josh asked who we wanted to catch the first pitch, I asked for either Reese Snyder or Kyle Thomas, mainly because those are two of the players that I know a little more personally than some of the others. It turned out that Reese would get the call, which was good because he was playing catcher that day and already had part of his gear on. Grace and I's first pitch was juuuuusssst a bit wide, but fortunately Reese Snyder was there to make the catch before it hit the dirt. He’d need it. Still with no idea how I was going to help Grace throw the ball, I opted for a left handed flip that got to the plate, but tailed out of the strike zone by a good 12 inches. Luckily, Reese slid to his right and made the catch before the ball hit the ground and skittered to the backstop. From the time we stepped foot on the field to the time we stepped off of it, the only time Grace stopped yowling was when we threw the ball. At that moment, she giggled. I knew she would. There has always been something about that motion that cracks her up every time. That’s why playing catch is one of my favorite things to do with her. And that’s part of the reason why Friday was so special. It was something that I knew Grace would enjoy. While she may never toe the rubber herself, we’ll always have Friday’s first pitch, plus a baseball signed by the whole Lancer team to remember it by. I know that the other first pitches are going to be just as special. We have ones scheduled with the Lincolnwood softball team for April 14, when they play the Lady Hiltoppers of Hillsboro, and for April 30, when Lincolnwood and Morrisonville play on the Mohawks’ home field. The Nokomis softball team has also reached out to us about having a Grace throw out a pitch, which will be awesome as well. Hopefully, we can avoid the post-nap grouch at those games, but if not, as long as I can hear that little giggle when the ball leaves my hand, all will be right in the world. We had some awesome baby sitters after the first pitch. Kayley, Kensey and Aunt Mikaela did an awesome job keeping Grace entertained while Mary and I covered the baseball and softball games. For as long as I can remember, holidays in my family were not always celebrated on the actual holiday. Sometimes, your birthday fell on a paper day, or we had to cut something short because of the paper. But it never changed the actual celebration. It always involved spending time with your family, and no matter when we celebrated, I always knew how much I was loved. Easter this year was no different for the Herschelmans. We started with a special egg hunt at Grace's preschool on Wednesday. The kids each found an egg with his or her name on it, and then got to look around the playground. Grace just loved the egg with her name on it, and it had a purple cross necklace inside it, which she wore for the rest of the day. Her preschool teachers tell me she really loves the songs they sing in school about Jesus, and that Jesus Loves Me is one of her very favorites. 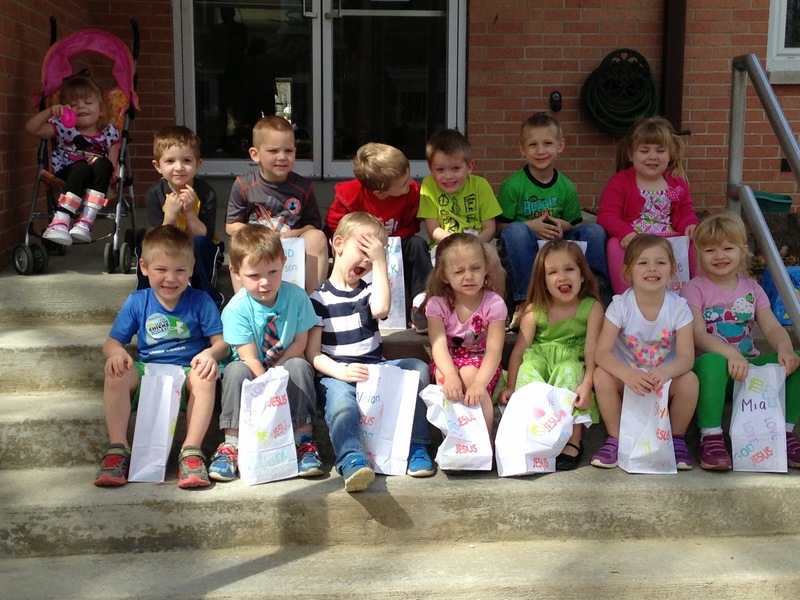 Grace with her preschool friends after their egg hunt. My mom and dad were going out of town on Easter, so we celebrated with them on Friday night with dinner and an egg hunt. Grace had an Easter basket, full of goodies, like a new Cardinals shirt. Gracie smiles with Grandma and Grandpa Galer. And while she couldn't exactly hunt the eggs herself this year, she was very excited to get them. They had change in them, so she liked shaking them, and just smiled at the big pile in her lap. All smiles after hunting eggs. Saturday we celebrated by getting some Easter sweet treats at the bake sale in Grace's honor, and then we went to a soccer game at Busch Stadium. One of the things I remember about Easter growing up was the jelly bean trail that led to my Easter basket. Johnny and I just loved following that trail to our baskets. At one point, I was looking forward to sharing that memory with Grace, but since it's kind of hard, the Easter Bunny left her basket right next to her bed where she would see it first thing in the morning. Daddy helps Grace check out the new clothes in her Easter basket. Then, it was time to get ready for church, and I could hardly wait for her to wear her new Easter dress, which was peach colored this year. We got up early for Sunday School, which Grace really loves. She likes to see her friends, and even helps me color on her papers a little. Our church service was very nice too. One of Grace's friends, Katie, asked if Grace could sit by her in church, and I'm not sure which one of the girls enjoyed it more. They also enjoyed an egg hunt after church in the park. Grace and Katie after the egg hunt. I was counting down the days to Easter this year for another reason. Before Lent started, I decided I would give up soda (mainly Diet Coke) for the entire Lenten season. I have given up things before, but not in several years. And I wasn't sure I wanted to do it this year. But as the days approached, I kept thinking about the miracle that I pray for each and every day. It seemed like I could do something so very small to think about the ultimate sacrifice Christ made for us. And it was really hard to do. I thought about that sacrifice so many times during the Lenten season, and also prayed for that miracle. Grace with three of the Herschelman siblings. After church (and after Kyle went through McDonald's to get me a Diet Coke), we headed to his grandma's house in Raymond for lunch and another egg hunt. It was so much fun to see everyone, and three of Kyle's cousins helped Grace hunt eggs, blow bubbles and just have a fun afternoon. Grace absolutely loved all the attention and just being with everyone. Grace loved all the attention from Kayley, Kensey and Katelyn, who had a very special card for Grace. Katelyn celebrated her birthday in March with a party for her friends. Instead of gifts, Katelyn asked them to donate to Grace's research study. Thanks, Katelyn! Grace and her daddy found the golden egg with $5 in for Grace's piggy bank! In a final celebration, we had dinner at my aunt and uncle's house in Hillsboro on Monday evening. 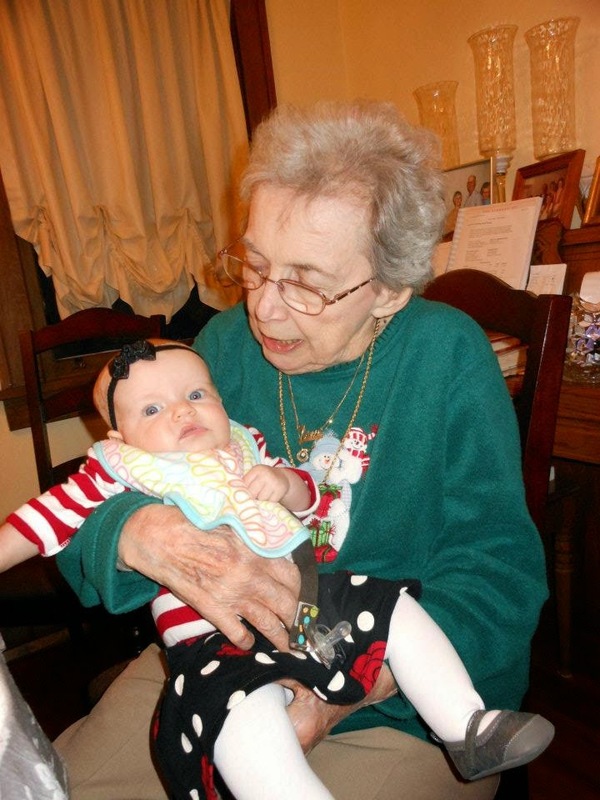 Since it's hard to find a time for everyone to get together, we also celebrated my grandma's 86th birthday and Grace's cousin, Izzy's second birthday. For dinner, Grace and Izzy are the new "kids" table, and since they're small, both sets of parents and cousin Keith get to sit at the "kids" table too. And it's kind of fun to still be seated at the kids table, even if the maturity level has gone up some over the years. We also had a great time watching Izzy open her birthday presents with delight, and just enjoyed being together. We loved celebrating Izzy's second birthday together! And in the end, that's what holidays come down to, a chance to be with the ones that you love. It doesn't matter when you celebrate or even what you do. It's just sharing time with some special people and telling them how much they mean to you, and holidays are a great excuse to do just that.